Wearing hockey jerseys, Devin Rattie and Emma Pace took the Sapporo stage early in the evening on Saturday (January 28). Hailing from Toronto, the duo known as City Kid Soul started their set with a few upbeat electro house tracks that reverberated around the Jacques Cartier Pier. Even though the dance floor was still sparse at this point, City Kid Soul soldiered on with a fun music selection, often clapping and raising their hands in the air. Their party-oriented performance was a nice match to Chocobeets' visuals, which included bright, flickering colours and naïve cut-up shapes projected on the towers beside the stage. As their show progressed, City Kid Soul got into some UK garage grooves, even hinting towards big beat influences. 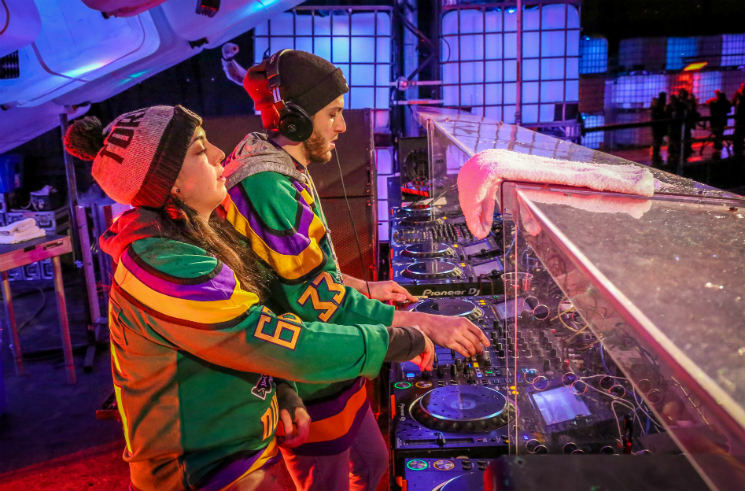 Mixing modern aesthetics and a '90s rave vibe, their set sounded tight coming through Igloofest's walls of speakers. The duo and their beats were a breath of fresh air in the week's main stage line-up that relied more on minimal techno and other tech-related styles.